Crawford joined Watsi on September 23rd, 2016. 14 other people also joined Watsi on that day! Crawford's most recent donation supported Sophal, a woman from Cambodia, to fund cataract surgery. Crawford has funded healthcare for 24 patients in 9 countries. Sophal is a vendor from Cambodia. She has two daughters, five sons, and eight grandchildren. She enjoys listening to monks pray on the radio and watching thai films. 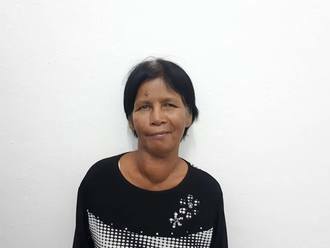 Six months ago, Sophal developed a cataract in each eye, causing her blurry vision, headaches, and photophobia. She has difficulty seeing things clearly, recognizing faces, and going anywhere outside. When Sophal learned about our medical partner, Children's Surgical Centre, she traveled for two hours seeking treatment. On August 8, doctors will perform a phacoemulsification surgery and an intraocular lens implant in each eye. After recovery, she will be able to see clearly. Now, she needs help to fund this $398 procedure. She says, "I hope I can see everything clearly. I hope to do my work soon and go to the pagoda by myself again to learn about Buddha." Elijah is a baby from Kenya. He is a twin. Elijah has four other older siblings. His parents are farmers. Elijah has been diagnosed with hydrocephalus, a condition in which excess cerebrospinal fluid accumulates in the brain and increases intracranial pressure. As a result of his condition, Elijah has been experiencing an increasing head circumference and iritability. Without treatment, Elijah will experience severe physical and developmental delays. Our medical partner, African Mission Healthcare Foundation, is requesting $685 to cover the cost of surgery for Elijah that will treat his hydrocephalus. The procedure is scheduled to take place on June 13 and will drain the excess fluid from Elijah's brain. This will reduce intracranial pressure and greatly improve his quality of life. With proper treatment, Elijah will hopefully develop into a strong, healthy young boy. Jefferson is an eight-day-old baby from Kenya. He is an only child to his young parents. Jefferson was born with spina bifida, a type of neural tube defect in which the spine does not properly close around the spinal cord. Without treatment, Jefferson is at risk of lower-limb paralysis, infection of the exposed nervous tissue, development of tethered cord syndrome, and possible developmental delays. Our medical partner, African Mission Healthcare Foundation, is requesting $1,097 to cover the cost of Jefferson's spina bifida closure surgery. The procedure is scheduled to take place on March 21. This procedure will hopefully spare Jefferson from the risks associated with his condition, instead allowing him to grow and develop along a healthy trajectory. “I really have faith that things will work out,” shares Jefferson’s mother. Jean Marc is a teacher from Haiti. He lives in Port-au-Prince, where he is a high school math teacher. Jean Marc has a cardiac condition called rheumatic mitral regurgitation. One of the four valves of Jean Marc's heart was severely damaged as a result of a rheumatic fever he suffered as a teenager, and it can no longer adequately pump blood through his body, leading to heart failure. Jean Marc will fly to Dominican Republic to receive treatment. On February 19, he will undergo cardiac surgery, during which doctors will remove the damaged valve and insert a mechanical replacement. University of Virginia is contributing $8,000 to pay for surgery. Jean Marc's family also needs help to fund the costs of surgery prep. The $1,500 bill covers labs, medicines, and checkup and followup appointments. It also supports passport obtainment and the social workers from our medical partner, Haiti Cardiac Alliance, who will accompany Jean Marc's family overseas. He says, "I am so thankful to everyone for giving me this chance to recover my health!" Sopham is an eighth grade student from Cambodia. She hopes to become a grade school teacher when she grows up. Sopham has had scoliosis for three years. This condition is progressing, causing discomfort, and making it difficult to sit in school for long periods of time. She needs to undergo a surgery to correct the position of her spine and prevent further worsening of the condition. Fortunately, Sopham visited our medical partner's care center and is scheduled to undergo spinal surgery on January 22. Now, her family needs help raising $1,500 to pay for the procedure. Sopham hopes that this surgery will eliminate her back pain so that she can return to school and spend time with her family. She says, "I am looking forward to returning to school and playing with my friends." Mal is a 29-year-old woman from Burma. She is a housewife who looks after her two daughters. Her husband is a pastor. One day in April 2016, Mal woke up with blurry vision in her right eye. She visited an optometrist, thinking that she may need glasses. She was told, however, that this was not an eye problem and was told to visit the hospital in Mandalay, where they would be better equipped to handle her treatment. At the hospital in Mandalay, she was given oral medication, but this did not help at all. Finally, she had an MRI, which showed a large mass or tumor growing in her brain and exerting pressure on her ocular nerves. Mal experienced headaches and lost her vision in both eyes. Mal sought treatment through our medical partner, Burma Children Medical Fund. She is now scheduled to undergo mass removal surgery on January 15. She is requesting $1,500 to cover the total cost of her procedure and care. Until she lost her vision, Mal used to help teach the congregation’s children every Saturday at Sabbath School. She also used to sew clothes for her own children and she loved to read. “I hope I will be able to do this again,” says Mal. Abraham is a casual laborer from Kenya. He is a hardworking father of one. Abraham is the firstborn in a family of four. He lost his parents when he was only ten, which forced him to drop out of school and to take care of his three younger sisters. On his way to work, Abraham was aboard a tractor loaded with logs. Unfortunately before reaching their destination, the tractor lost control and hit a wall. Abraham broke his leg, while the others only suffered minor injuries. Abraham is not able to walk on his own and experiences pain. Fortunately, surgeons at our medical partner can help. On November 23, Abraham will undergo a fracture repair procedure, called an open reduction and internal fixation. This treatment will enable him walk again and go back to work again Now, our medical partner, African Mission Healthcare Foundation, is requesting $968 to fund this procedure. 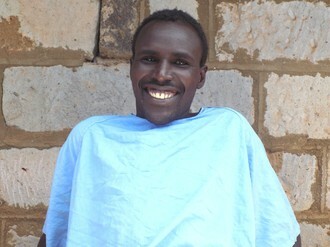 “I pray to God to give me good health so that continue working hard," says Abraham. Floice is a three-week-old boy from Kenya with myelomeningocele, the most serious form of spina bifida. In the case of this condition, the spinal cord fails to develop properly and protrudes through an opening in the back. Because of this, Floice experiences weakness in his lower limbs, is irritable, and is unable to feed properly. Without treatment, he will be at risk of developing infections and a tethered cord, leading to permanent spinal deformities. On June 21, Floice will undergo surgery to close the gap in his spinal cord. Our medical partner, African Mission Healthcare Foundation, is requesting $1,097 to help fund this treatment in addition to the $62 that has been subsidized by Floice's family. “Even if we are not able to raise the required funds, we are hopeful that Floice will be well," says Floice's father. Thi is a 29-year-old woman who lives with her family in a village in Ayeyarwady Division, Burma. She is a housewife, and her husband is a motorcycle taxi driver. Their son is a student in sixth grade. Their family income is enough to cover their family’s basic needs, but they are unable to save any money. For the last 15 years, Thi has periodically experienced fatigue, shortness of breath, and chest pain. She has been diagnosed with heart disease, and her condition requires surgery. On September 12, Thi will undergo a double valve replacement heart procedure. Our medical partner, Burma Children Medical Fund, requests $1,500 for her treatment. “After I get better from surgery, I will be work as much as I can to increase my family income and I will pay back my debt," says Thi.